Start off your visit on the 12th (Fri): learn about winemaking at Margerum Wine Company and then look for all kinds of wild species at Douglas Family Preserve. For maps, where to stay, other places to visit, and more tourist information, go to the Santa Barbara itinerary maker tool . Kalamazoo to Santa Barbara is an approximately 10.5-hour flight. You can also drive. Due to the time zone difference, you'll gain 3 hours traveling from Kalamazoo to Santa Barbara. Traveling from Kalamazoo in April, expect Santa Barbara to be somewhat warmer, temps between 71°F and 50°F. Finish your sightseeing early on the 13th (Sat) so you can drive to San Simeon. On the 14th (Sun), explore the historical opulence of Hearst Castle, look for all kinds of wild species at Piedras Blancas, and then visit a coastal fixture at Piedras Blancas Light Station. On your second day here, explore and take pictures at Moonstone Beach Dr, then tour the pleasant surroundings at Moonstone Beach, and then hike along Fiscalini Ranch Preserve. To find traveler tips, reviews, where to stay, and more tourist information, refer to the San Simeon road trip planning website . Drive from Santa Barbara to San Simeon in 3 hours. Alternatively, you can take a bus; or do a combination of train and bus. Traveling from Santa Barbara in April, expect nights in San Simeon to be slightly colder, around 43°F, while days are somewhat warmer, around 78°F. Wrap up your sightseeing on the 15th (Mon) early enough to travel to Avila Beach. Avila Beach is an unincorporated community in San Luis Obispo County, California, United States, located on San Luis Obispo Bay about 160 miles (257 km) northwest of Los Angeles, and about 200 miles south of San Francisco. On the 16th (Tue), grab your bike and head to Bob Jones City to Sea Bike Trail, visit a coastal fixture at Point San Luis Lighthouse, then race across the water with a speed boat tour, and finally stop by Alapay Cellars. To find ratings, where to stay, photos, and other tourist information, refer to the Avila Beach trip maker app . You can drive from San Simeon to Avila Beach in an hour. While traveling from San Simeon, expect slightly colder days and somewhat warmer nights in Avila Beach, ranging from highs of 72°F to lows of 49°F. Finish your sightseeing early on the 16th (Tue) to allow enough time to travel to Yosemite National Park. Get outdoors at Nevada Falls Loop and Glacier Point. 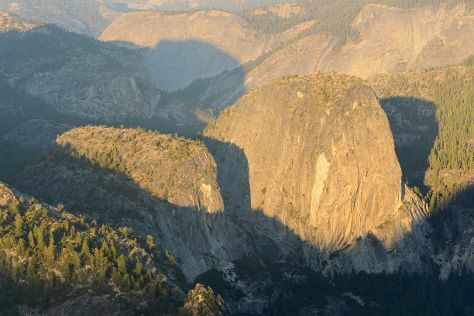 Eschew the tourist crowds and head to Sentinel Dome and Panorama Trail. Spend the 18th (Thu) exploring nature at Elizabeth Lake, Yosemite National Park. And it doesn't end there: admire the sheer force of Yosemite Falls, tour the pleasant surroundings at Cathedral Beach Picnic Area, and make a trip to Yosemite Conservation Heritage Center. To find ratings, other places to visit, reviews, and tourist information, use the Yosemite National Park online day trip planner . Use the Route module to find suitable travel options from Avila Beach to Yosemite National Park. Traveling from Avila Beach in April, you will find days in Yosemite National Park are a bit cooler (59°F), and nights are colder (28°F). Wrap up your sightseeing on the 19th (Fri) to allow time to travel back home.